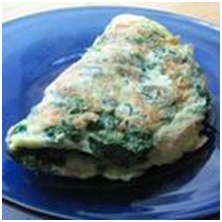 1.In a bowl, beat the eggs, and stir in the baby spinach and Parmesan cheese. Season with onion powder, nutmeg, salt, and pepper. 2.In a small skillet coated with cooking spray over medium heat, cook the egg mixture about 3 minutes, until partially set. Flip with a spatula, and continue cooking 2 to 3 minutes. Reduce heat to low, and continue cooking 2 to 3 minutes.